For people who really are in a hurry, here is what this article about. 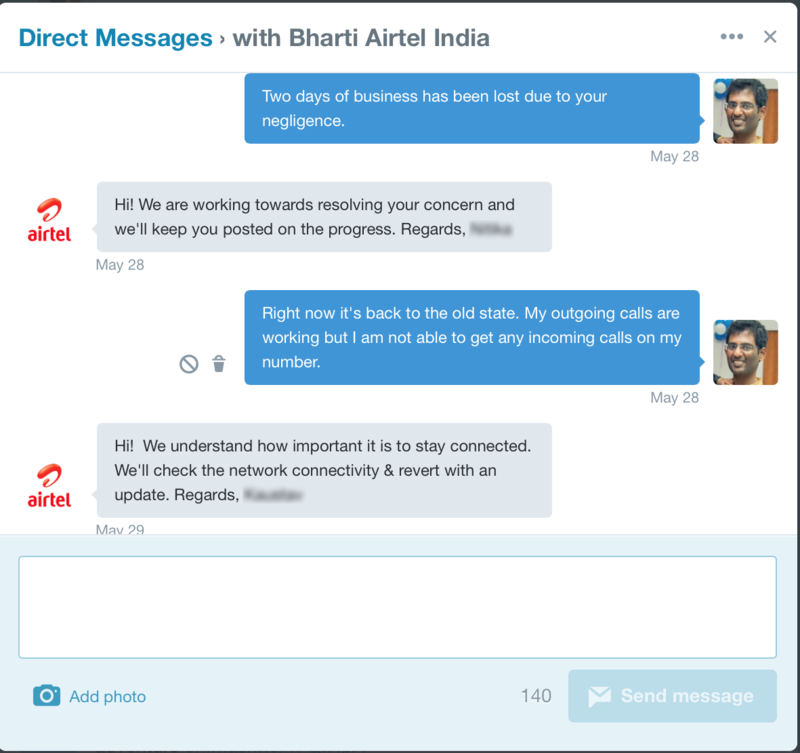 I am trying to vent out my frustration and anger against Airtel through this blog post so that some action will be taken soon, period! My number has been ported from Idea to Airtel on 26th May 2015 at 11:00 PM and Airtel literally fuc*ed up the entire process! In short, I haven’t been receiving any incoming calls, no incoming SMS nor outgoing SMS since then. All I get is Airtel signals, outgoing calls and an active data connection, when someone calls my number it says that the number does not exist!!. 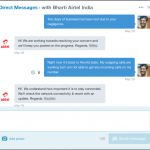 Airtel has no bloody fuc*ing clue how it’s affecting my work and I really want to let people know how unwise it is to port to Airtel, so read on. 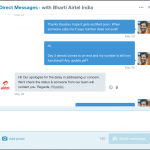 PS: Please please please share this article to ensure that some reliable and responsible Airtel employee sees this and resolves my issue. So now all I want to do is to list down how this issue fuc*ed up my work and then the follow up I had to make with no positive result yet! Thanks to me relying completely on technology and the super secure 2-step authentication and OTP for logins each and every website that relies on this has blocked me out as I am not able to receive any SMS! – My office bank accounts have been locked out as I am not able to get authentication SMS while I login hence no official transactions since the past one week. – My Gmail has been blocked out as I am not able to get the verification pin needed to login. Yes, I do use the 2-step authentication enabled! – I am unable to book any cabs when I am out on road without my own car. – As Airtel gives a message that my does not exist when someone tries to reach me few of my clients literally assumed that I shut shop and ran away from my business!!! And the list just goes on. 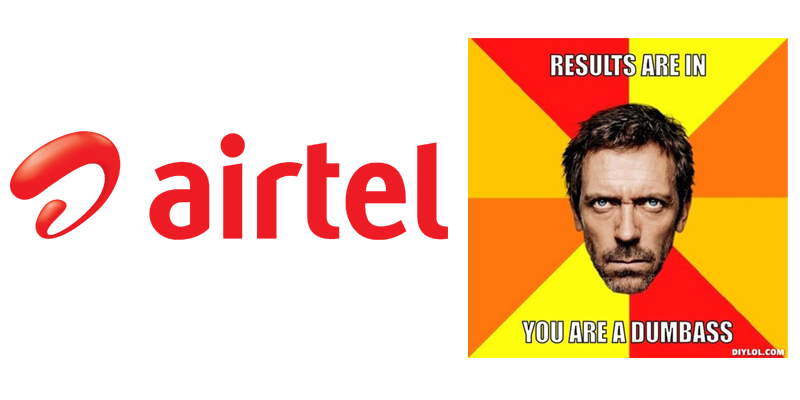 I learnt a lesson how not to rely too much on technology now, all thanks to Airtel! 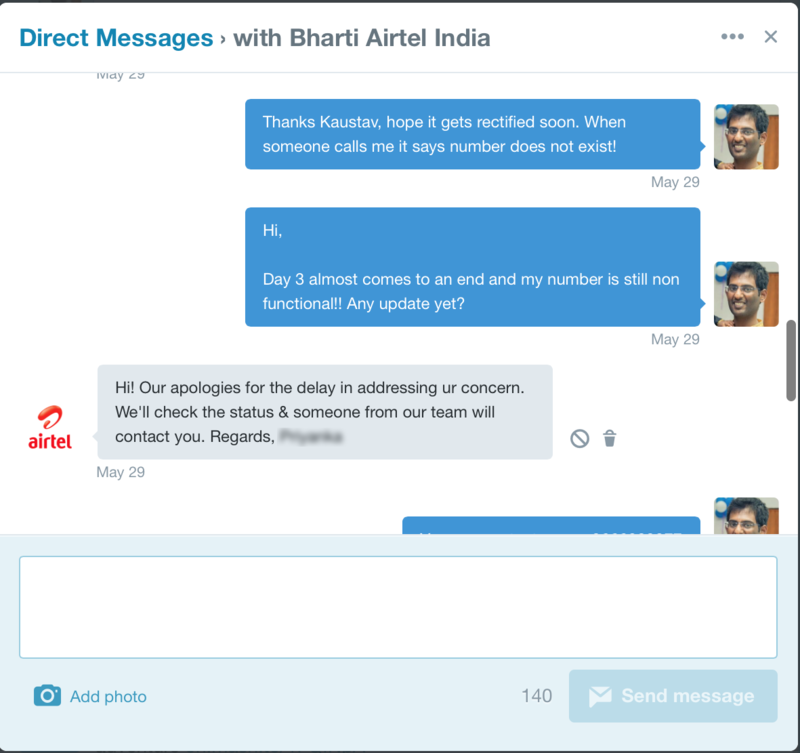 I have been following up with Airtel right since 07:30 AM on 27th May 2015 but the issue hasn’t been resolved at all, they seem to be hardly bothered about my problem! I have been speaking to their customer care on 121 and made more than 30 calls over the past one week only to be given a commitment date for resolution that has never been honoured at all! – The first commitment was given saying that the issue will be resolved in 12 hours. – The next commitment was given stating that the issue will be resolved over the next 24 hours. 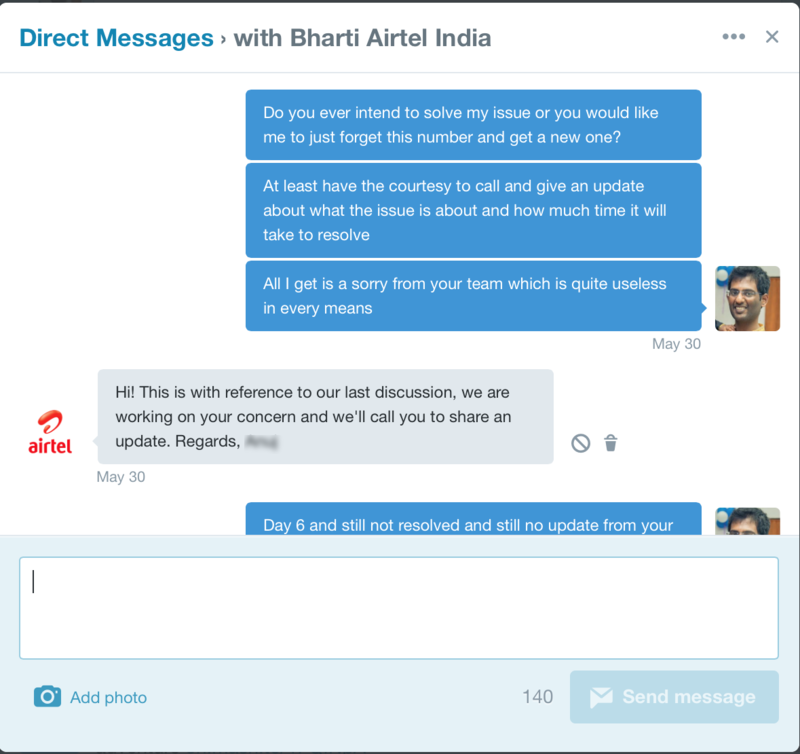 – The next commitment date given to me was that the issue will be resolved by 20th May 2015. – The next commitment date given to me was that it will be resolved by 31st May 2015. – Then 1st June 2015. – Then evening of 1st June 2015. 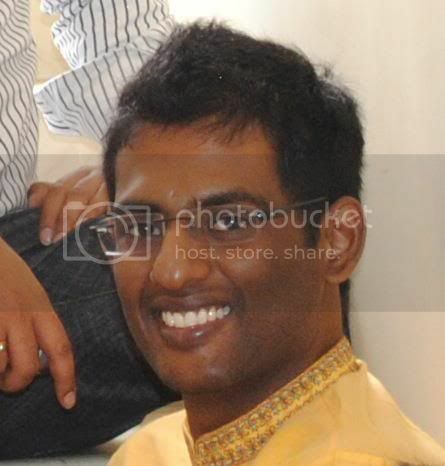 – And now, today, I get a commitment date of 4th June 2015! One of their supervisor was so bloody careless enough and tells me that the issue has been registered only on 28th May 2015 and they need time till 4th June 2015 for sure. Their support on Twitter seems to be even more lame! All I get is a sorry, that they will get back to me soon and they will ensure that the issue is resolved, they are neither sorry nor got back to me soon nor resolved my issue! Airtel representative Mr. Teja who came down to my office on 20th May 2015 to collect all relevant documents to help me with the porting process and opt for the Rs. 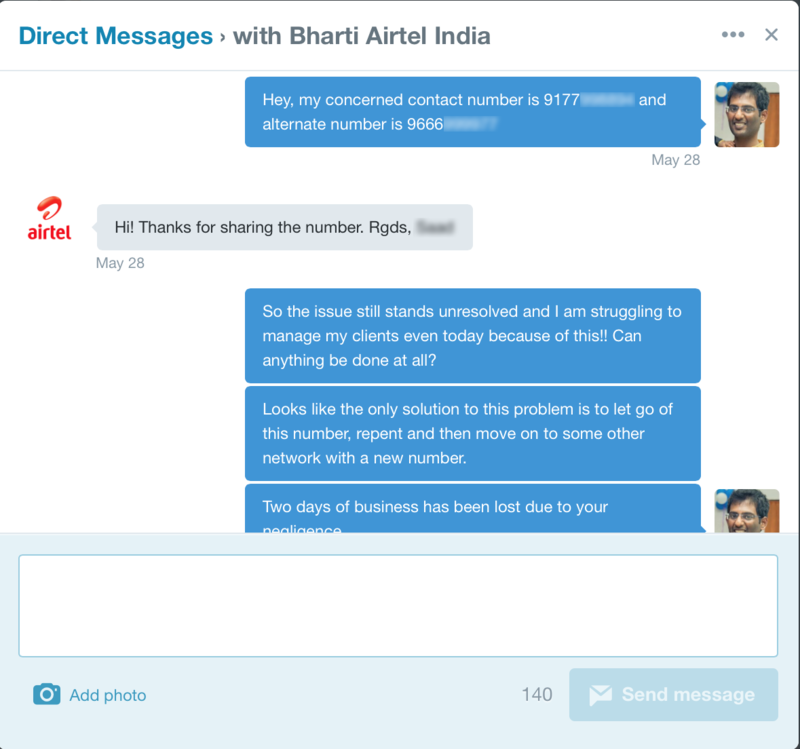 1599 Airtel My Plan was as useless as he can be too and so was his Manager Mr. Sai. He was super prompt to drive down to our office so that he can reach his targets but when I called him up on 30th May 2015 to help me resolve the issue he hardly bothered to do so and didn’t care to either pick my calls henceforth nor provide me with an update. 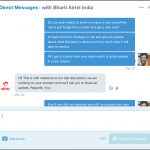 On 30th May 2015, an Airtel technical representative drove down to our home and examined my phone with the Airtel sim in it. He concluded that changing the SIM might help solve the issue so requested me to get the SIM changed. I didn’t really want to leave any stone unturned so I actually drove down to the Banjara Hills branch in Hyderabad, talked to them about the issue, got a form to fill in and later was told that they do not have any nano sim cards and requested me to head over to some other location. Then I drove down to the Raj Bhavan road brand and talked to Mr. Ramesh, the only helpful soul till date. He checked his system and showed me that the number is being shown up as a “Free Number” which implies that it is not a registered Airtel number and he cannot even change the sim for such number, brilliant!! 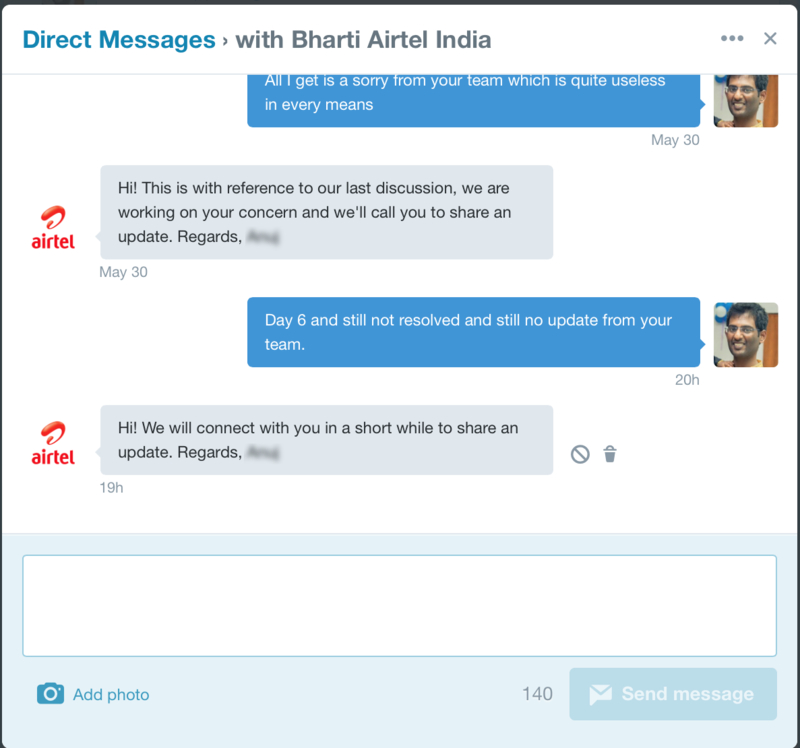 So, after 7 days of wait and several emails, several phone calls, several trips to local office and several message to their customer care on twitter my Airtel number is still having issues and I lost almost 7 days of active work. 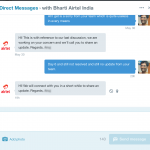 Brilliant Airtel, this is the kind of welcome every customer expects from your network. Kudos! Startup Weekend Hyderabad – Global Startup Battle	Grofers – Has Potential, But A Long Way To Go!